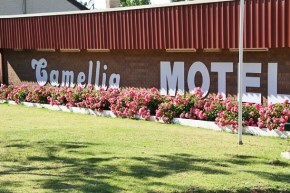 The Camellia Motel is conveniently located accommodation on the Newell Highway at the northern end of Narrandera a few minutes from the junction of the main highways to Melbourne, Sydney, Perth (via Adelaide) or Brisbane and walking distance to the main shopping/dining area. 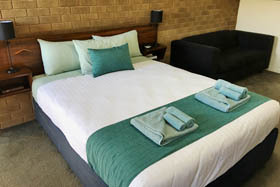 Opposite a leafy open park, the warm welcoming ambience of our recently renovated motel offers clean, cosy & inviting accommodation. The all ground floor units are non smoking and have designated parking outside each. Choose from the room service breakfast served at a preferred time in the morning or the convenient choice for early departures which is delivered the evening before. Only a short stroll to the local main shopping area, clubs, restaurants, cafes and also ideally situated as the closest motel to the Golf Club & Racecourse. 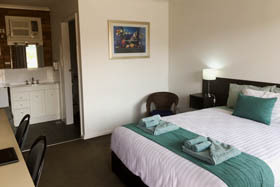 A diverse range of well appointed accommodation units to suit visitors to the Riverina, the corporate rep or passing traveller. Narrandera is located 549 km Southwest of Sydney and 428km Northwest of Melbourne at the junction of the Sturt and Newell Highways. 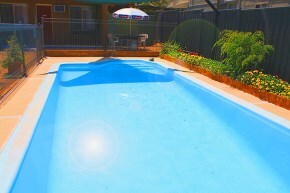 Narrandera is situated between the two major regional cities of Wagga Wagga (99kms) and Griffith (98kms). There are direct Flights daily to Sydney and Country Link Rail Services to both Sydney and Melbourne.